Sigismund of Luxemburg (14 February 1368 – 9 December 1437) was Prince-elector of Brandenburg from 1378 until 1388 and from 1411 until 1415, King of Hungary and Croatia from 1387, King of Germany from 1411, King of Bohemia from 1419, King of Italy from 1431, and Holy Roman Emperor for four years from 1433 until 1437, the last male member of the House of Luxemburg. He was regarded as highly educated, spoke several languages (among them French, German, Hungarian, Italian, and Latin) and was an outgoing person who also took pleasure in the tournament. Sigismund was one of the driving forces behind the Council of Constance that ended the Papal Schism, but which in the end also led to the Hussite Wars that dominated the later period of Sigismund's life. He was buried in Nagyvárad, Kingdom of Hungary (now Oradea, Romania), next to the tomb of the King Saint Ladislaus I of Hungary. Born in Nuremberg, Sigismund was the son of the Holy Roman Emperor, Charles IV, and of his fourth wife, Elizabeth of Pomerania, the granddaughter of King Casimir III of Poland, and the great-granddaughter of the Grand Duke of Lithuania, Gediminas. He was named after Saint Sigismund of Burgundy, the favourite saint of Sigismund's father. From Sigismund's childhood he was nicknamed the "ginger fox" (liška ryšavá) in the Crown of Bohemia, on account of his hair colour. On the death of her father in 1382, his betrothed, Mary, became queen of Hungary and Sigismund married her in 1385 in Zólyom (today Zvolen). The next year, he was accepted as Mary's future co-ruler by the Treaty of Gy?r. However, Mary was captured, together with her mother, Elizabeth of Bosnia, who had acted as regent, in 1387 by the rebellious House of Horvat, Bishop Paul Horvat of Ma?va, his brother John Horvat and younger brother Ladislav. Sigismund's mother-in-law was strangled, while Mary was liberated. To ease the pressure from Hungarian nobles, Sigismud tried to employ foreign advisors, which was not popular, and he had to promise not to give land and nominations to other than Hungarian nobles. However, this was not applied to Stibor of Stiboricz, who was Sigismund's closest friend and advisor. On a number of occasions, Sigismund was imprisoned by nobles, but with help of the armies of Garai and Stibor of Stiboricz, he would regain power. In 1396 Sigismund led the combined armies of Christendom against the Turks, who had taken advantage of the temporary helplessness of Hungary to extend their dominion to the banks of the Danube. This crusade, preached by Pope Boniface IX, was very popular in Hungary. The nobles flocked in the thousands to the royal standard, and were reinforced by volunteers from nearly every part of Europe, the most important contingent being that of the French led by John the Fearless, son of Philip II, Duke of Burgundy. Sigismund set out with 90,000 men and a flotilla of 70 galleys. After capturing Vidin, he camped with his Hungarian armies before the fortress of Nicopolis. Sultan Bayezid I raised the siege of Constantinople and, at the head of 140,000 men, completely defeated the Christian forces in the Battle of Nicopolis fought between the 25 and 28 September 1396. Sigismund returned by sea and through the realm of Zeta, where he ordained a local Montenegrin lord ?ura? II with the islands of Hvar and Kor?ula for resistance against the Turks; the islands were returned to Sigismund after Durad's death in April 1403. The disaster in Nicopolis angered several Hungarian lords, leading to instability in the kingdom. Deprived of his authority in Hungary, Sigismund then turned his attention to securing the succession in Germany and Bohemia, and was recognized by his childless half-brother Wenceslaus IV as Vicar-General of the whole Empire. However, he was unable to support Wenceslaus when he was deposed in 1400, and Rupert of Germany, Elector Palatine, was elected German king in his stead. Due to his frequent absences attending to business in the other countries over which he ruled, he was obliged to consult Diets in Hungary with more frequency than his predecessors and institute the office of Palatine as chief administrator while he was away. In 1404 Sigismund introduced the Placetum Regium. According to this decree, Papal bulls could not be pronounced in Hungary without the consent of the king.During his long reign the royal castle of Buda became probably the largest Gothic palace of the late Middle Ages. In about 1406 Sigismund married Mary's cousin Barbara of Celje (Barbara Celjska, nicknamed the "Messalina of Germany"), daughter of Count Hermann II of Celje. Hermann's mother Katarina Kotromani? (of the House of Kotromanic) and Mary's mother Queen Elizabeta (Elisabeth of Bosnia) were sisters, or cousins who were adoptive sisters. Tvrtko I was their first cousin and adopted brother, and perhaps even became heir apparent to Queen Mary. Tvrtko may have been murdered in 1391 on Sigismund's order. Sigismund managed to establish control in Slavonia. He did not hesitate to use violent methods, but from the river Sava to the south his control was weak. Sigismund personally led an army of almost 50,000 "crusaders" against the Croats and Bosnians, culminating with the Battle of Dobor in 1408, a massacre of about 200 noble families, many of them victors of numerous battles against the Ottomans. Sigismund founded his personal order of knights, the Order of the Dragon, after the victory at Dobor. Members of the order were mostly his political allies and supporters. The most important European monarchs became members of the order. He encouraged international trade by abolishing internal duties, regulating tariffs on foreign goods and standardizing weights and measures throughout the country. On a number of occasions, and in 1410 in particular, Sigismund allied himself with the Teutonic Knights against W?adys?aw II of Poland. In return for 300.000 ducats he would attack Poland from the south after the truce on St. John's Day, 24 June expired. Sigismund ordered his most loyal friend Stibor of Stiboricz to set up the attack on Poland. Stibor of Stiboricz was of Polish origin and from the main line of the powerful Clan of Ostoja that had also been against choosing Jagiello as King of Poland. With the support of Sigismund, Stibor become one of the most influential men in late medieval Europe, holding titles as Duke of Transylvania and owning about 25% of modern-day Slovakia, including 31 castles of which 15 were situated around the 406 km long Váh river with surrounding land that was given to him by Sigismund. In the diplomatic struggle to prevent war between Poland-Lithuania, which was supported by the Muscovites, and the Teutonic Knights, Sigismund used Stibor's fine diplomacy to gain financially. The Polish side appointed several negotiators and most of them were also from the Clan of Ostoja, distant relations of the Stibors. However, those "family meetings" could not prevent the war and an alliance of twenty-two western states formed an army against Poland in the Battle of Grunwald in July 1410. Stibor attacked then Nowy S?cz and burned it to the ground, but after that he returned with his army back to the Beckov Castle. After the Polish-Lithuanian victory in the Battle of Grunwald, the Teutonic knights had to pay a huge sum of silver to Poland as reparation and again, through diplomacy of his friend Stibor, Sigismund was able to borrow all this silver from King W?adys?aw II of Poland on good conditions. In the light of facts about the diplomatic work of Stibor and the Clan of Ostoja that was following the politics of King Sigismund, one can question whether Sigismund actually joined the anti-Polish alliance. 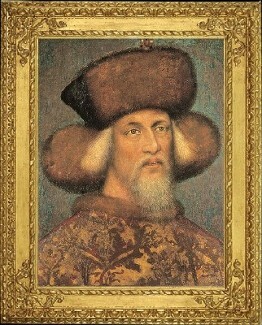 From 1412 to 1423 Sigismund campaigned against the Venetians in Italy. The king took advantage of the difficulties of Antipope John XXIII to obtain a promise that a council should be called in Constance in 1414 to settle the Western Schism. He took a leading part in the deliberations of this assembly, and during the sittings made a journey to France, England and Burgundy in a vain attempt to secure the abdication of the three rival popes. The council ended in 1418, solving the Schism and — of great consequence to Sigismund's future career — having the Czech religious reformer, Jan Hus, burned at the stake for heresy in July 1415. The complicity of Sigismund in the death of Hus is a matter of controversy. He had granted him a safe-conduct and protested against his imprisonment; and the reformer was burned during his absence. It was also at this Council that a cardinal ventured to correct Sigismund's Latin (he had construed the word schisma as feminine rather than neuter). To this Sigismund replied: I am king of the Romans and above grammar. This utterance prompted historian Thomas Carlyle to give him the nickname "Super Grammaticam" from the Latin response that he had given ("Ego sum rex Romanus et super grammaticam"). In 1428 Sigismund led another campaign against the Turks, but again with few results. In 1431 he went to Milan where on 25 November he received the Iron Crown as King of Italy; after which he remained for some time at Siena, negotiating for his coronation as emperor and for the recognition of the Council of Basel by Pope Eugenius IV. He was crowned emperor in Rome on 31 May 1433, and after obtaining his demands from the Pope returned to Bohemia, where he was recognized as king in 1436, though his power was little more than nominal. Shortly after he was crowned, Pope Eugenius began attempts to create a new anti-Ottoman alliance. This was sparked by an Albanian revolt against the Ottomans, which had begun in 1432. In 1435, Sigismund sent Fruzhin, a Bulgarian nobleman, to negotiate an alliance with the Albanians. He also sent Daud, a pretender to the Ottoman throne, in early 1436. However, following the defeat of the rebels in 1436, plans for an anti-Ottoman alliance ended. Sigismund died on 9 December 1437 at Znojmo (German: Znaim), Moravia (now Czech Republic), and as ordered in life, he was buried at Nagyvárad, Hungary (today Oradea, Romania), next to the tomb of the king Saint Ladislaus I of Hungary, who was the ideal of the perfect monarch, warrior and Christian for that time and was deeply venerated by Sigismund. By his second wife, Barbara of Celje, he left an only daughter, Elisabeth of Luxembourg, who was married to Albert V, duke of Austria (later German king as Albert II) whom Sigismund named as his successor. As he left no sons his line of the House of Luxembourg became extinct on his death. Sigismund married twice but had little luck in securing the succession to his crowns. Each of his two marriages resulted in the birth of one child. His first-born child, probably a son, was born prematurely as a result of a horse riding accident suffered by Queen Mary of Hungary when she was well advanced in pregnancy. Mother and child both died shortly after the birth in the hills of Buda on 17 May 1395. This caused a deep succession crisis because Sigismund ruled over Hungary by right of his wife, and although he managed to keep his power, the crisis lasted until his second marriage to Barbara of Celje. Barbara's only child, born in the purple on 7 October 1409, probably in the castle of Visegrád, was Elisabeth of Luxembourg, the future queen consort of Hungary, Germany and Bohemia. Queen Barbara was unable to give birth to any further issue. Elisabeth of Bohemia was thus the only surviving legitimate offspring of Sigismund. Sigismund was known to speak fluent Hungarian, wore Hungarian style royal clothes and even grew his beard in the Hungarian fashion. He also spent huge amounts of money during his reign to rebuild the Gothic castles of Buda and Visegrád in the Kingdom of Hungary, ordering the transportation of materials from Austria and Bohemia. The Reformatio Sigismundi appeared in connection with efforts to reform the Holy Roman Empire during the reign of Emperor Sigismund (1410–1437). It was presented in 1439 at the Council of Basel, published by an anonymous author, and referred to the injustice of the German rulers. 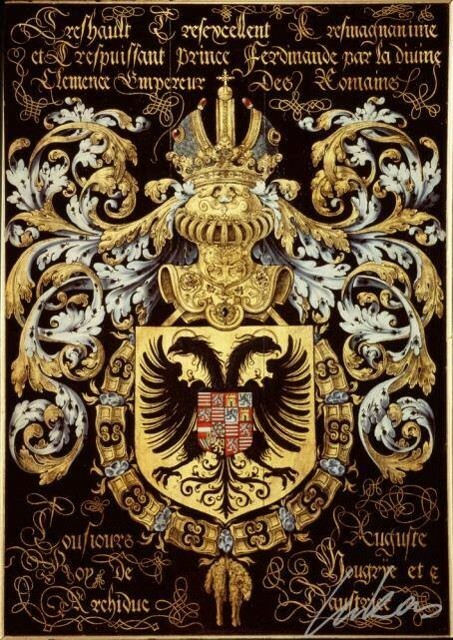 It included a vision of Sigismund's about the appearance of a priest-king, Frederick, as well as plans for a wide reform of the monarchy (and emperorship) and the (German) empire. Sigismund, by God's grace, Holy Roman Emperor; King of the Romans, of Hungary, Bohemia, Italy, Dalmatia, Croatia, Rama, Serbia, Galicia, Lodomeria, Cumania and Bulgaria; Prince of Silesia and Luxembourg; Margrave of Moravia, Lusatia and Brandenburg.